Based on a 1980’s TV-show with the same name, Microgaming has delivered yet another great video slot with a nice retro look and a couple of fun bonus rounds. If you have seen the TV-show, you will notice that some of the not so stellar prices appear in this slot as well. The TV-show was similar to Jeopardy where teams threw darts to see which question they would have to answer, the darts would also give different amounts of points depending on the throw. The host was Jim Bowen, Tony Green was in charge of the darts section, and the animated Bully was their mascot of sorts. In this slot, Bully is your host instead of Mr. Bowen. 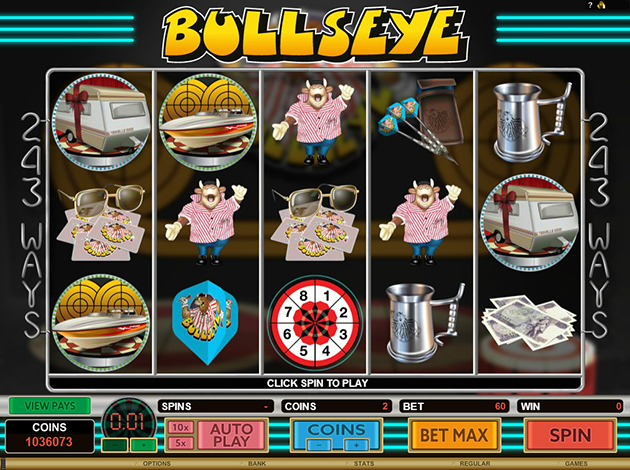 The video slot Bullseye has the staggering 243 ways to win over 5 reels and 3 rows. The soundtrack gets you thinking of the TV-show Bullseye straight away, and the graphics are very clean and smooth. There are of course some cool bonus features in this game, let’s start with the Scatters. The Scatter-symbols looks like a dart board with the text “FREE SPINS” in the middle so it’s hard to miss them. If you manage to get 3 or more Scatters, it will start a bonus round with at least 15 free spins where all winnings are multiplied by 2x for even bigger wins. Wilds in this game are your host Bully where it says “BULLSEYE” in the bottom of the symbol. A Wild can replace any other symbol except for Scatters if it gives you a winning combination, except for the Scatter symbol. You will hopefully manage to get the dart board bonus as well, it will take you to a bonus round where you throw darts on 8 different places on a dart board and win different kinds of prizes depending on what hides behind the different places of the dart board. Other symbols are: a red car, a trailer, darts, sun glasses, a tankard, a boat, along with other fun and well-made ones. Microgaming is known as one of the best game providers on the market with a respectable reputation. They are the brains behind famous slots like Immortal Romance, Thunderstruck, Jurassic Park and many more. They always manage to make games that players just can’t stop loving. We on Videoslots.com are of course very proud and happy to have Microgaming as a part of our beloved video slot family. If you are still unsure about this game you can try it out for free in the demo version of the game. In order to enter the demo version you just have to log out from your Videoslots.com account and thereafter start the game. Once you get to know how awesome this game and it’s bonus features are you can start playing for real money and drag home those big wins. It is now time for you throw the darts yourself and try your luck. We on Videoslots.com wishes you all the best of luck with this game, we are sure that you will enjoy throwing darts just as much as we did!